Contemporary homes are no more divided into specific and definite environments as it occurred in the past. Do you remember the dinette, the classical kitchen, rooms overlooking the aisle, but above all the traditional living room, to be used on special occasions only? Today there are day and night areas, but also indoor and outdoor spaces that increasingly intersect, trespassing into the other. Interior design is more flexible, relaxed, easy-going. Therefore compositional freedom for architects and end users is an unavoidable condition. Many furnishing solutions are available to meet that need. Such as Rimadesio Self, a modular system, which allows to create single and double-sided sideboards, tables, drawer units and suspended wall compositions. 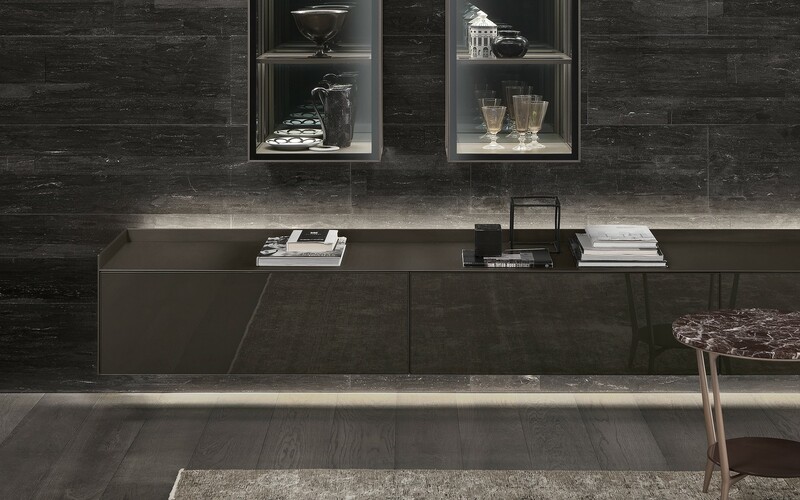 A project whose main quality is versatility, combining the aesthetics of Rimadesio lacquered glass in all its variety of colours, 62 different shades. The system consists of set of drawers and flap doors, completely covered by lacquered glass, and wooden open modules. Rimadesio also offers Self Up, with aluminium legs and Self Bold, which you can find in our Gallery shop. Self Bold is so special: it immediately seizes your attention. A simple and minimal design, perfect and pure lines, continuous surfaces: Self bold is the suspended modular system becoming a sideboard, expressing Rimadesio essential and contemporary design. Have a nice design week! !